Have you been making an attempt to guess someone’s Instagram parole however are failing each time? Does one have a real reason to own access to their password? If the solution is affirmative, then this Instagram Hack app is terribly effective in breaking into someone’s account during a short span of regarding 10 minutes or less. Some individuals use these apps to retrieve their own passwords that they need forgotten whereas others would possibly try and have a good time with their friends. 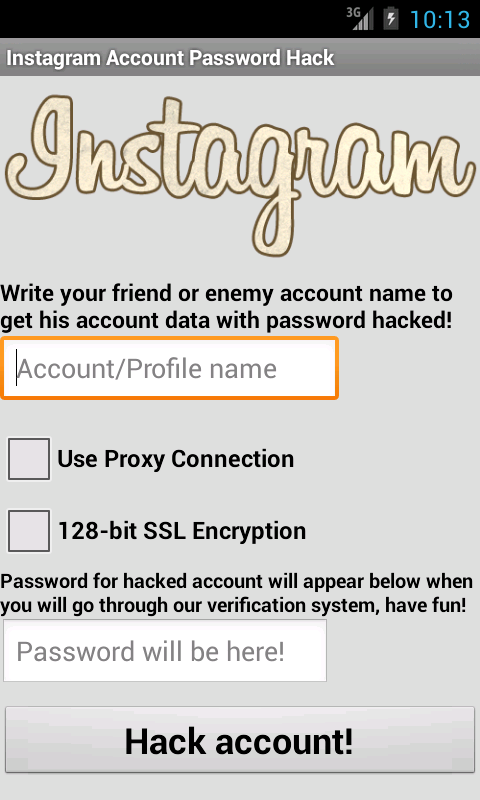 Instagram Hack Password Account 2019 Our Instagram Hack offers you easy hacking of desired user account. Ever wanted to make a prank for your friend or ruin the life of your biggest enemy? Now it is possible with our tool! Features -Low Instagram Hack Account Password size -No viruses, ads -Instant password and account data provided after verification -Easy to use We encourage you to try our Instagram Password Hack, you won't be disappointed. Get it now!